This five-page mini-workbook is designed for K-3 students learning about colonial America. It focuses on Elizabeth Lucas (1722-1793), who introduced indigo cultivation to South Carolina in the eighteenth century. Activities for this content-area reading include multiple-choice questions, handwriting/spelling practice, summation, and map work. Click here to print this five-page mini-workbook for primary school (lower elementary) students. 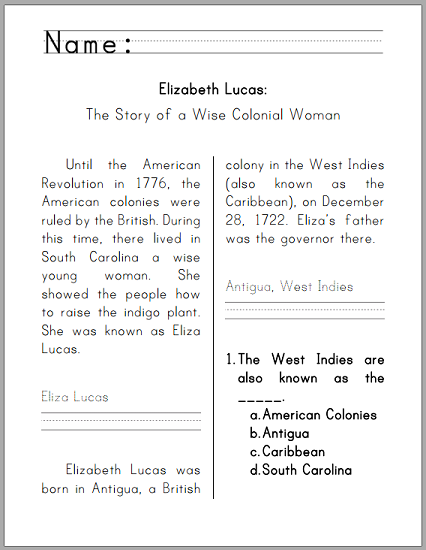 For our other free printable lower elementary American History workbooks, click here.